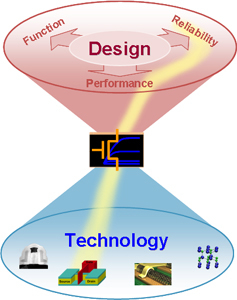 Our group's research interests focus on modeling and design techniques for reliable, low-power and high-performance systems, driven by advances in nanoelectronics and information analytics. The overarching goal of the NIMO Group is to advance the state of the art in interdisciplinary solutions for robust intelligient system design. Neural-inspired computing for learning on-a-chip, with high energy efficiency. Reliability modeling and design solutions, such as aging effects in scaled technology. Predictive Technology Model (PTM) for CMOS, memory and beyond. Reconfigurable design for fast prototyping, design validation and post-Si tuning. Exploratory design with emerging technologies. Copyright © 2007 NIMO Group. All Rights Reserved.